10th (Irish) Division is raised. James Duffy was born on 17 November 1889 in Gweedore, County Donegal in Ireland. 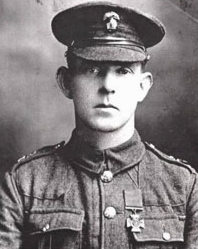 He was 28 years old and was a stretcher-bearer and a Private in the 6th Battalion The Royal Inniskilling Fusiliers when he was awarded the Victoria Cross (VC). On 27 December 1917 at Kereina Peak, Palestine, whilst the company was holding a very exposed position, Private Duffy went froward with another stretcher-bearer to bring in a seriously wounded comrade. When the other man was wounded, Private Duffy returned to get another stretcher-bearer, who, when they went forward, was killed almost immediately. He then went forward alone and, under very heavy fire, succeeded in getting both wounded men under cover and attended to their injuries. His conspicuous bravery saved both men's lives. No. 6/17978 Pte. James Duffy, B. Innis. danger under very heavy fire. Click on the video below to view James Duffy meeting The Queen in 1966 when she attended the 50th anniversary of the Battle of the Somme at the Balmoral Showgrounds, Belfast in 1966. It also includes scenes from the ceremony of remembrance at the Thiepval memorial. James Duffy VC died aged 79 in Drumany, Letterkenny on 8 April 1969 and was buried in Conwal Cemetery, County Donegal. His VC is in the collection of the Inniskillings Museum, Enniskillen Castle, County Fermanagh.